​City crews will be completing the parkway lighting replacement around Lake Harriet this spring. Parkway lights will be relocated from the lake side of the parkway to the boulevard opposite the lake in two locations: south of Lake Harriet between Queen Avenue and Morgan Avenue and northeast of the lake between King’s Highway and 43rd Street. The relocated lights will help preserve mature vegetation by moving equipment access away from the lake and provide even lighting distribution for the parkway and adjacent sidewalk. Adjacent trail lighting will not be impacted. At the end of this round of lighting replacements, all parkway lights on Lake Harriet Parkway will have been replaced. This work is a collaboration between the Minneapolis Park and Recreation Board and City of Minneapolis. It's Friday Night! Come to the park as we provide different weekly activities and movies! Don't miss the fun! We will also serve dinner so please let staff know any food allergies when signing up. We need 5 kids signed up by Wednesday the week of the program for it to happen. The deadline to sign up is the day before so we have enough food for the night. Each class will be a creative flow that connects breath to movement and balances effort with relaxation. Build strength, find flexibility and enjoy the many benefits of classic yoga. Suitable for all levels, even beginners! Stop at the park, call 612-370-4948 or email lyndalefarmstead@minneapolisparks.org for more information and to check out additional program offerings. Minneapolis' demographics are changing rapidly, making it more important than ever to ensure that the MPRB meets the needs of the city's diverse stakeholders. Therefore, the MPRB is developing a plan - RecQuest - for the next generation of recreation centers in Minneapolis. The MPRB operates 49 year-round, neighborhood-based recreation centers, and leases two recreation centers to non-profit organizations. Most facilities were built in the 1960s and 1970s and are nearing the end of their useful life. As a neighborhood with a smaller center, East Harriet is definitely vulnerable and closing the Lyndale Farmstead rec center could be a future option on the table. RecQuest will set the stage for the next 25-30 years of capital improvements at recreation centers. It will also tailor recreation center facilities and programs to meet the current and projected recreation needs of communities across the city. Click on link to read a current Southwest Journal article about the Roberts Bird Sanctuary from the perspective of the people who visit the sanctuary often. The Minneapolis Park & Recreation Board (MPRB), Audubon Chapter of Minneapolis (ACM), East Harriet Farmstead Neighborhood Association (EHFNA) and LInden Hills Neighborhood Council (LHNC) have formed a partnership to create a long term management plan that will revitalize the Roberts Bird Sancuary and preserve its legacy. The MPRB hopes to have a draft of the long-term management plan complete by June 2011. The MPRB will then ask the three involved groups, ACM, EHFNA and LHNC, to review the draft and respond with comments. MPRB staff will present the plan to the MPRB Board on July 6th with a meeting for public input to be scheduled shortly after that. The current timeline would have this project wrapped up by the end of summer 2011. Located in Lyndale Park, the Thomas Sadler Roberts Bird Sanctuary includes about 13 acres of woodland and wetland north of Lake Harriet and south of Lakewood Cemetery. ACM is an Adopt-A-Park partner at the bird sanctury. Projects for 2010 included public bird walks, bird and plant surveys and invasive species removal. Visit the ACM website for more information about the ACM and its role in this project. Minneapolis Park, Recreation and Board (MPBR) receives top honor for 6th year in a row! Read more about MPRB receiving this honor here. The Lyndale Farmstead Recreation Center is available for rentals when it is available, including the weekends when we are closed. It is a popular site for children's birthday parties, so please make your reservations at least two weeks in advance. Contact the director for more information: 612-370-4948. The Lyndale Park Garden staff would like to invite neighbors to rediscover the many garden spaces we offer, only footsteps from Lake Harriet, and located within the East Harriet neighborhood boundaries! 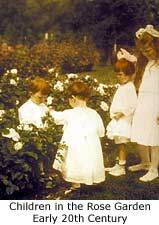 Our Rose Garden, the 2nd oldest public rose garden in the United States, presents Hybrid Teas, Floribundas, Grandifloras, Climbers and Hardy Shrub Roses in over 60 beds. 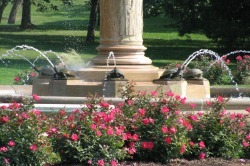 The Heffelfinger Fountain borders the northeastern end of the roses, and leads visitors to the Perennial/Annual Border. Here, you will learn the botanical and common names for many beautiful perennials, and see outstanding color in the large rectangular beds. Be sure to enjoy the Phelps Fountain, too! Across the street, the Peace Garden features 365 days of beauty – from early blooming Phlox and Rock Cress, to eye-catching winter displays of unusual conifers. Following Roseway Road toward King’s Highway, the Trial Gardens feature newly-bred plants being evaluated for hardiness, disease resistance, form and color. 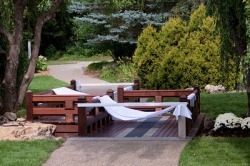 It is faithfully maintained by the Men’s Garden Club of Minneapolis. West of the Trial Gardens are the Butterfly and Hummingbird Gardens, featuring annuals and perennials which attract some of our favorite pollinators. More information about the park can be found on the Lyndale Park website and their facebook page. Lyndale Park can always use more help at the gardens! If you are interested in learning about Horticulture, or just love the park and want to get involved, please email volunteer@minneapolisparks.org for the general park, or mgcmgarden@q.com for opportunities with the Men’s Garden Club.